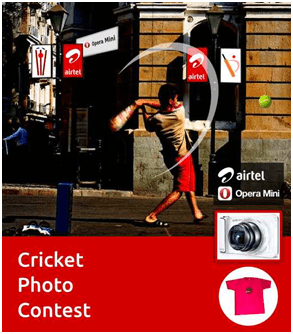 Cricket Photo Contest By Airtel And Opera Software Announced! Is it just IPL on your mind these days? Bharti Airtel, a leading global telecom services provider, in partnership with Opera Software, makers of Opera browser for desktop PCs, mobiles, TVs and other devices, has announced an online Cricket Photo Contest to know the cricketer in you. The contest invites the millions of Opera Mini users, using an Airtel connection, to upload and share their favorite gully cricket moments. 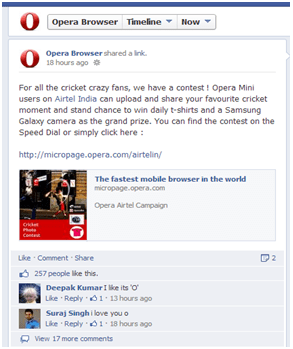 This would make them eligible to win Opera T-shirts everyday and a Samsung Galaxy camera as the grand prize. Play, click, share and win! The contest began on 9th April and will conclude on 21stMay 2013. This initiative from Opera aims to reach out to maximum cricket lovers on an Airtel connection in the country, at a time when IPL flavor is high. The contest will be promoted heavily on social media via Opera’s Facebook page (which has over 4.4milion likes and more than 150,000 people talking about it at the moment) and Twitter handle (which has near 2500 people following it). Are Android Tablets Edging Out the iPad? Aircel Offers Cutting-edge Internet Services With Free Facebook & Whatsapp!